Reclaim! Remain! Rebuild! 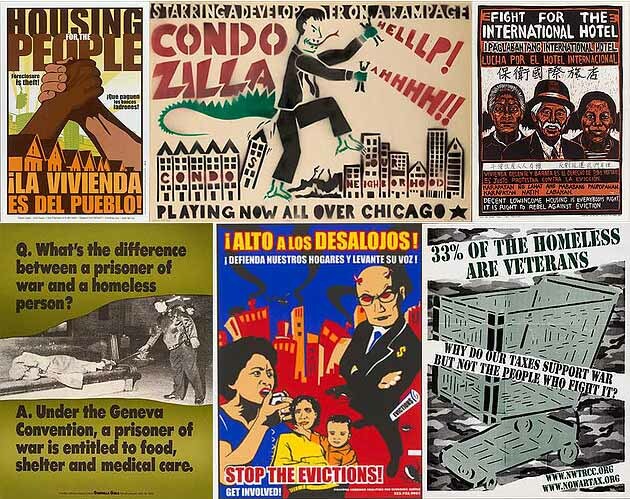 Posters on Affordable Housing, Gentrification & Resistance features 75 powerful posters (from the collection of the Center for the Study of Political Graphics) created during the last 60 years about a housing crisis that is more urgent now than ever. The exhibition includes posters from Boyle Heights to Boston, from Melbourne to Paris. Topics covered include restrictive covenants, gentrification, displacement, homelessness, community building, and resistance. Housing is a battleground. It is central in the struggle to build thriving and inclusive communities. Posters are a powerful and strategic tool to oppose gentrification and displacement, promote affordable housing, and publicize the plight and rights of the homeless. Posters educate and inspire people to action. These graphics document a crisis that is local, national, and international, and affirm that housing is a human right. In line with CSPG’s mission of using art to educate and inspire people to action, a panel, tours, and poster-making workshop will accompany the exhibition. On Saturday, June 10th, 1-4 PM, printmaker Ernesto Vazquez will lead a linoleum cut workshop for participants to make their own political graphics (Space is limited, please RSVP: cspg@politicalgraphics.org). All events are free and open to the public. CSPG is an activist, educational, and research archive with more than 90,000 social movement posters from the 19th century to the present, including the largest collection of post-World War II political posters in the United States. This exhibition features posters from multiple Justseeds’ artists, including Jesus Barraza, Josh MacPhee, and Faviana Rodriguez. Lower images L to R: What’s the Difference…?, Guerrilla Girls, Offset, 1991, New York, NY; Community Control of the Land, Favianna Rodriguez, Center for the Study of Political Graphics (CSPG), Self-Help Graphics (SHG), Strategic Actions for a Just Economy (SAJE), Silkscreen, 2002; 33% of the Homeless are Veterans, San Francisco Print Collective, Silkscreen, 2006, San Francisco, CA.